In one of the "Create-Your-Own-Costume" threads, I speculated that a thread for pictures of Watchmen costumes made for Halloween might be a good idea. But then I thought "Why stop with Watchmen?" If any of you guys have crafted costumes for Watchmen, put pictures of them up here! I can't wait to see your handiwork. Post subject: Re: Halloween costumes! I haven't the time for Halloween tomorrow. The Phillies are having their parade tomorrow! 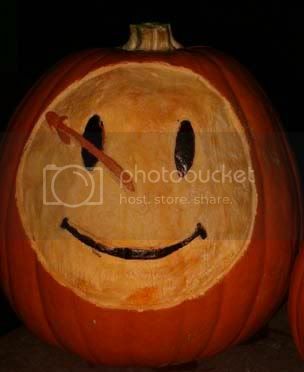 Take a look at some die-hard fans’ Watchmen-themed character costumes and Halloween decorations. 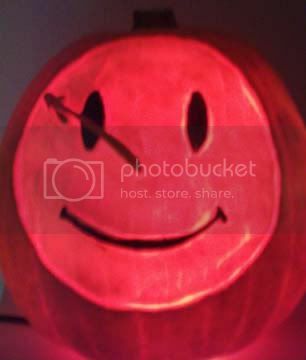 Here is a pumpkin I carved for Halloween. "It's all crap. Who needs all this hardware to catch hookers and purse-snatchers?" I'm doing the first Silk Spectre, but I've changed it a bit out of necessity. I'll try to put a picture here after Halloween. That stupid hair is giving me a lot of trouble. Wore my Stormtrooper gear to school today, I'm busting out Rorschach tonight! I'll get some photos tonight for sure. Hey man, that's actually pretty good! Nice job. Very cool! You really got the detail down. Stained coat and all. I won't be wearing my stormtrooper stuff tonight but I will be serving candy from one of my helmets. People in the neighborhood really like it. 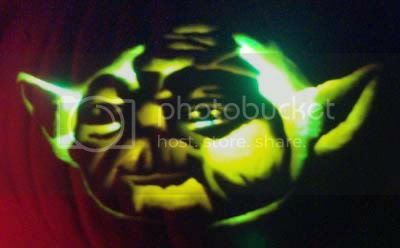 Here is the Yoda pumpkin I carved. This is mine, not nearly as spectacular. So I wore it to school. I kept hearing "Invisible Man...?" but once and awhile someone would gasp "No way...RORSCHACH!" I didn't place at all in the contest, but I don't think that the judges knew who I even was. Next year! 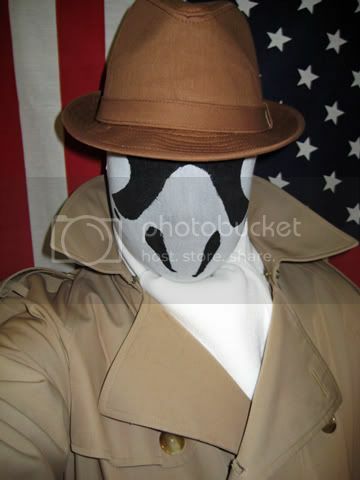 This is the best Rorschach costume I've ever seen. Very very nice. The world will look up and shout: "Give us candy!" And I'll look down and whisper: "No." Last edited by Stranger Stranger on Fri Oct 31, 2008 5:52 pm, edited 1 time in total. I have been taking mine inside every night so no one gets any ideas. those night owl costumes crack me up, good thing they updated for the film! I wanted to dress up as either Rorschach or Scarecrow (Batman Begins/Dark Knight) or Special Agent Dale Cooper (Twin Peaks) but I just didnt have time to arrange anything. But since I'm mexican and we are running this thing until November 2nd, I'll still give it a try, it's not customary to dress up on Dia de Muertos, but just why the heck not? Well, I finished the costume, suffocated once, and well, it turned out great! Here's a bunch of pics. 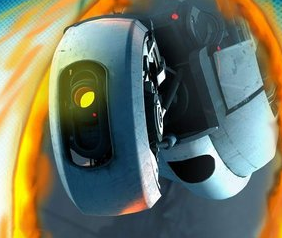 I think this one is messed up a bit horizontally. Heres a picture I took before the ink blots. Hope you've enjoyed these and that you've had a great Halloween! i wore my comedian costume to school (sorry, i lost my camera so i dont have any pictures of it) and i have to say 90% of the people didn't know who i was and it was so annoying, but it was worth it to get kids i dont know randomly coming up to me and saying "oh my god thats an awesome costume"
I remember a couple years ago in high school, I saw a guy dressed as Rorschach and a girl dressed as Laurie making out. My mind was murdered. Oh yeah, I went to a costume party once as non-costumed Veidt. I just wore a purple suit with the Veidt logo on the breast pocket. Non-fans just assumed I was a pimp or something, while fans who saw the logo thought it was a cleverly subtle costume.